Failures caused by electrostatic discharges (ESD) constitute a major problem concerning the reliability and robustness of integrated circuits and electronic systems. 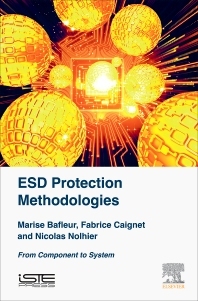 This book summarizes the many diverse methodologies aimed at ESD protection and shows, through a number of concrete studies, that the best approach in terms of robustness and cost-effectiveness consists of implementing a global strategy of ESD protection. ESD Protection Methodologies begins by exploring the various normalized test techniques that are used to qualify ESD robustness as well as characterization and defect localization methods aimed at implementing corrective measures. Due to the increasing complexity of integrated circuits, it is important to be able to provide a simulation in which the implemented ESD protection strategy provides the desired protection, while not harming the performance levels of the circuit. Therefore, the main features and difficulties related to the different types of simulation, finite element, SPICE-type and behavioral, are then studied. To conclude, several case studies are presented which provide real-life examples of the approaches explained in the previous chapters and validate a number of the strategies from component to system level. Marise Bafleur is Research Director at the Laboratory for Analysis and Architecture of Systems (LAAS-CNRS) in Toulouse, France. Fabrice Caignet is a Lecturer at Paul Sabatier University in Toulouse, France. .
Nicolas Nolhier is Professor in Electronics at Paul Sabatier University in Toulouse, France.